Vim (/vɪm/; a contraction of Vi IMproved) is a clone, with additions, of Bill Joy's vi text editor program for Unix. It was written by Bram Moolenaar based on source for a port of the Stevie editor to the Amiga and first released publicly in 1991. Vim is designed for use both from a command-line interface and as a standalone application in a graphical user interface. Vim is free and open-source software and is released under a license that includes some charityware clauses, encouraging users who enjoy the software to consider donating to children in Uganda. The license is compatible with the GNU General Public License through a special clause allowing distribution of modified copies "under the GNU GPL version 2 or any later version". Although it was originally released for the Amiga, Vim has since been developed to be cross-platform, supporting many other platforms. In 2006, it was voted the most popular editor amongst Linux Journal readers; in 2015 the Stack Overflow developer survey found it to be the third most popular text editor, and the fifth most popular development environment in 2018. The name "Vim" is an acronym for "Vi IMproved" because Vim is an extended version of the vi editor, with many additional features designed to be helpful in editing program source code. Originally, the acronym stood for "Vi IMitation", but that was changed with the release of Vim 2.0 in December 1993. A later comment states that the reason for changing the name was that Vim's feature set surpassed that of vi. June, 1987 N/A Tim Thompson releases Stevie (ST editor for VI enthusiasts), a limited vi clone for the Atari ST, posting the source on Usenet. June, 1988 N/A Tony Andrews improves Stevie, and ports it to Unix and OS/2, releasing version 3.10 on Usenet. 1992 1.22 Port to Unix. Vim now competes with vi. December 14, 1993 2.0 This is the first release using the name Vi IMproved. April 27, 1998 5.2 Long line support, file browser, dialogs, popup menu, select mode, session files, user defined functions and commands, Tcl interface, etc. August 31, 1998 5.3 Bug fixes, etc. January 16, 2000 5.6 New syntax files, bug fixes, etc. June 24, 2000 5.7 New syntax files, bug fixes, etc. May 31, 2001 5.8 New syntax files, bug fixes, etc. September 26, 2001 6.0 Folding, plugins, multi-language, etc. May 12, 2007 7.1 Bug fixes, new syntax and runtime files, etc. August 9, 2008 7.2 Floating point support in scripts, refactored screen drawing code, bug fixes, new syntax files, etc. August 10, 2013 7.4 A new, faster regular expression engine. September 12, 2016 8.0 Asynchronous I/O support, jobs, lambdas, etc. May 18, 2018 8.1 Terminal window support and terminal gdb plugin. Graphical Vim (gVim) under GTK+ 2. Like vi, Vim's interface is not based on menus or icons but on commands given in a text user interface; its GUI mode, gVim, adds menus and toolbars for commonly used commands but the full functionality is still expressed through its command line mode. Vi (and by extension Vim) tends to allow a typist to keep their fingers on the home row, which can be an advantage for a touch typist. Vim has a built-in tutorial for beginners (accessible through the vimtutor command). There is also the Vim Users' Manual that details Vim's features and a FAQ. This manual can be read from within Vim, or found online. Vim also has a built-in help facility (using the :help command) that allows users to query and navigate through commands and features. Part of Vim's power is that it can be extensively customized. The basic interface can be controlled by the many options available, and the user can define personalized key mappings—often called macros—or abbreviations to automate sequences of keystrokes, or even call internal or user-defined functions. There are many plugins available that will extend or add new functionality to Vim. These complex scripts are usually written in Vim's internal scripting language, vimscript (also known as VimL). Vim also supports scripting using Lua (as of Vim 7.3), Perl, Python, Racket (formerly PLT Scheme), Ruby, and Tcl. There are projects bundling together complex scripts and customizations and aimed at turning Vim into a tool for a specific task or adding a major flavour to its behaviour. Examples include Cream, which makes Vim behave like a click-and-type editor, or VimOutliner, which provides a comfortable outliner for users of Unix-like systems. Vim has a vi compatibility mode, but, when not in this mode, Vim has many enhancements over vi. However, even in compatibility mode, Vim is not entirely compatible with vi as defined in the Single Unix Specification and POSIX (e.g., Vim does not support vi's open mode, only visual mode). Vim has nevertheless been described as "very much compatible with Vi". Some of Vim's enhancements include completion, comparison and merging of files (known as vimdiff), a comprehensive integrated help system, extended regular expressions, scripting languages (both native and through alternative scripting interpreters such as Perl, Python, Ruby, Tcl, etc.) including support for plugins, a graphical user interface (known as gvim), limited integrated development environment-like features, mouse interaction (both with and without the GUI), folding, editing of compressed or archived files in gzip, bzip2, zip, and tar format and files over network protocols such as SSH, FTP, and HTTP, session state preservation, spell checking, split (horizontal and vertical) and tabbed windows, Unicode and other multi-language support, syntax highlighting, trans-session command, search and cursor position histories, multiple level and branching undo/redo history which can persist across editing sessions, and visual mode. Vim script (also called vimscript or VimL) is the scripting language built into Vim. Based on the ex editor language of the original vi editor, early versions of Vim added commands for control flow and function definitions. Since version 7, Vim script also supports more advanced data types such as lists and dictionaries and (a simple form of) object-oriented programming. Built-in functions such as map() and filter() allow a basic form of functional programming, and Vim script has lambda since version 8.0. Vim script is mostly written in an imperative programming style. Vim macros can contain a sequence of normal-mode commands, but can also invoke ex commands or functions written in Vim script for more complex tasks. Almost all extensions (called plugins or more commonly scripts) of the core Vim functionality are written in Vim script, but plugins can also utilize other interpreted languages like Perl, Python, Lua, or Ruby (if support for them is compiled into the Vim binary). Vim script files are stored in plain text format and the file name extension is .vim. There are libraries for Vim script available on www.vim.org as Vim plugins. Whereas vi was originally available only on Unix operating systems, Vim has been ported to many operating systems including AmigaOS (the initial target platform), Atari MiNT, BeOS, DOS, Windows starting from Windows 95, OS/2, OS/390, MorphOS, OpenVMS, QNX, RISC OS, Linux, BSD, and Classic Mac OS. Also, Vim is shipped with every copy of Apple macOS. Independent ports of Vim are available both for Android and iOS. Neovim is an extension of Vim that strives to improve the extensibility and maintainability of Vim. Neovim shares the same configuration syntax with Vim; as a result, the same config file can be used with both editors. As of version 0.1, released in December 2015, Neovim is compatible with almost all of Vim's features. The Neovim project was started in 2014, with some Vim community members offering early support of the high-level refactoring effort to provide better scripting, plugins, and integration with modern GUIs. The project is open source and the full code is available on GitHub. Neovim had a successful fundraiser on March 23, 2014, supporting at least one full-time developer. Several frontends are under development, making use of Neovim's capabilities. The Neovim editor is available in Ubuntu's PPAs, and several other package managers, making it possible to install on a variety of Linux-based operating systems. Learning the vi and Vim Editors, a tutorial book for vi and vim, published by O'Reilly Media. ^ a b Paul, Ryan (2011-11-02). 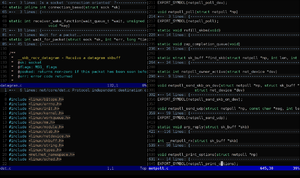 "Two decades of productivity: Vim's 20th anniversary". Ars Technica. Retrieved 2011-11-04. ^ "Releases". Retrieved 17 May 2018 – via GitHub. ^ "Vim in non-English languages". Retrieved 14 December 2010. ^ Vim documentation: intro: "Vim is pronounced as one word, like Jim, not vi-ai-em. It's written with a capital, since it's a name, again like Jim." ^ "Vim documentation: uganda". vimhelp.org. ^ "Linux Journal: 2003 Readers' Choice Awards". 2003-11-01. Retrieved 2006-05-24. ; "Linux Journal: 2004 Readers' Choice Awards". 2004-11-01. Retrieved 2006-05-24. ; "Linux Journal: 2005 Readers' Choice Awards". 2005-09-28. Retrieved 2006-05-24. ^ "Stack Overflow Developer Survey 2015 § IV. Text Editor". Stack Overflow. Retrieved July 25, 2016. ^ "Stack Overflow Developer Survey 2016 Results". Stack Overflow § VII. Development Environments. Retrieved July 25, 2016. ^ "The continuing story of Vim" (PDF). ^ Vim (20 January 2015). "intro.txt". Vim Help. Vim. Archived from the original on 9 July 2016. Retrieved 9 July 2016. ^ "vim(1)". die.net. Vim. 11 April 2006. Archived from the original on 9 July 2016. Retrieved 9 July 2016. Vim is based on Stevie, worked on by: Tim Thompson, Tony Andrews and G.R. (Fred) Walter. Although hardly any of the original code remains. ^ "ICCF Holland — helping children in Uganda". ICCF Holland. Retrieved 2007-10-23. ^ a b "Filewatcher". Archived from the original on July 11, 2011. Retrieved February 26, 2011. ^ a b c d e f g Moolenaar, Bram (2002-01-15). "Vim, an open-source text editor". Retrieved 2005-10-24. ^ a b Thompson, Tim (2000-03-26). "Stevie". Retrieved 2010-12-27. ^ Tim Thompson (1987-06-28). "A mini-vi for the ST". Newsgroup: comp.sys.atari.st. Usenet: 129@glimmer.UUCP. Retrieved 2010-12-27. ^ Tony Andrews (1988-06-06). "v15i037: Stevie, an "aspiring" VI clone for Unix, OS/2, Amiga". Newsgroup: comp.sources.unix. Usenet: 893@fig.bbn.com. Retrieved 2010-12-27. ^ "Official Vim Manual, Version 4 summary". 2004-03-12. Retrieved 2008-08-06. ^ "Official Vim Manual, Version 5 summary". 2004-01-17. Retrieved 2008-08-06. ^ "Official Vim Manual, Version 6 summary". 2004-03-12. Retrieved 2008-08-06. ^ "Vim Reference Manual, Version 7". 2016-07-17. Retrieved 2019-01-13. ^ Google Discussiegroepen. Groups.google.com. Retrieved on 2013-12-09. ^ Bram Moolenaar. "Vim 8.0 released!". Retrieved September 12, 2016. ^ Bram Moolenaar. "Vim 8.1 is released!". Retrieved May 18, 2018. ^ Lamb, Linda; Robbins, Arnold (1998). Learning the Vi Editor. O'Reilly Media, Inc. p. 305. ISBN 9781565924260. ^ Oualline, Steve (April 2001). Vi IMproved (VIM) (PDF). New Riders Publishers. ISBN 0-7357-1001-5. ^ "Vim documentation: usr_41". vimhelp.org. ^ "Vim documentation: if_mzsch". 11 February 2010. "Vim Online: Downloads". Retrieved 2007-01-07. ^ "Mac OS X Manual Page For vim(1)". developer.apple.com. Apple Inc. Retrieved 2010-01-12. ^ "VimTouch, the development has stalled on this app". Retrieved 2015-08-09. ^ "DroidVim, under active development". Retrieved 2017-03-05. ^ "Vim - Applidium, mobile agency in Paris". Archived from the original on 2012-01-20. Retrieved 2015-08-11. ^ "Neovim: vim, out of the box". ^ "How to start using Neovim instead of Vim". ^ "Neovim: Rebuilding Vim For the 21st Century". ^ "GitHub - neovim/neovim: Vim-fork focused on extensibility and usability". ^ "Mac OS X frontend". ^ "Neovim wiki: installation instructions". Wikimedia Commons has media related to Vim.